Sweet Pineapple Jam Recipes Make Delicious Practical .Jams, also called SeLei is the food used as a complementary adjunct or topping in the presentation of a variety of cakes and snacks. The basic ingredients of manufacture is in the form of fruit juice mixed with sugar sweeteners and other additives. Among the fruits are often processed into jams are pineapple, grapes, and strawberries. Jams various flavors of various fruits processed it can be obtained easily in various mini markets, supermarkets to stalls with practical packaging size varied ranging from small to large. Besides can be obtained by way of purchase it, you can also make this jam easily through the kitchen home and only requires ingredients are quite simple in the manufacturing process as well as pineapple jam which we will try to share the weave as shown below. After the completion ripe pineapple, peeled, cored bentolan black next and then cut into pieces and wash. Set aside. Provide grater and grate the pineapple slices that have been cleaned up to be fine. If necessary you can also grind back by means of a blender. Beerikutnya, ripe pineapple smooth over the pan over low heat until cooked. Then enter the sugar to dishes fine pineapple iar with lemon juice and cinnamon powder. Toss well and let stand for ½ hours until it becomes liquid and sticky taste. Remove, drain and let cool. Enter chilled pineapple jam into a container with a lid such as jars. 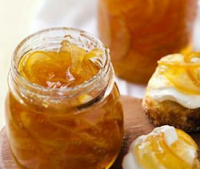 Made pineapple jam can be used as a complement sweetener topping cakes or bread. Hopefully ways of making pineapple jam above can help you in the making at home and good luck! 0 Komentar Untuk "Sweet Pineapple Jam Recipes Make Delicious Practical"